Preheat the oven to 200°C. Line a tray with baking paper. De-stem the mushrooms and place them on the tray. Drizzle olive or coconut oil over the mushrooms, season with salt and pepper and bake in the oven for 15minutes, or until the mushrooms are tender. They will shrink in size a little. When cooked, place the mushrooms stem side down on paper towel to remove excess moisture. Allow to cool. While the mushrooms are cooking get the rest of your vegetables ready. Slice the tomatoes, avocado, red onion and cheese. Wash the lettuce and dry with paper towel. To make the patties combine beef mince, onion, egg and herbs together in a bowl. Shape mixture into 3 patties (ensure they are not larger than the mushrooms). Heat olive or coconut oil in a large frying pan over medium heat. Add patties. Cook for 4-5 minutes each side, or until cooked through. When all of the ingredients are ready, build your burger. Enjoy! * more filling ideas: cucumber, pickle, sauerkraut, baby spinach, grated carrot, beetroot. If you want a burger but want to ditch carbs then give this a try! Gluten free friends, you're going to love this! Instead of bread this recipe uses mushrooms to hold all of the tasty insides together. I kept this recipe nice and simple, just like an old fashioned cheeseburger (sans bread). 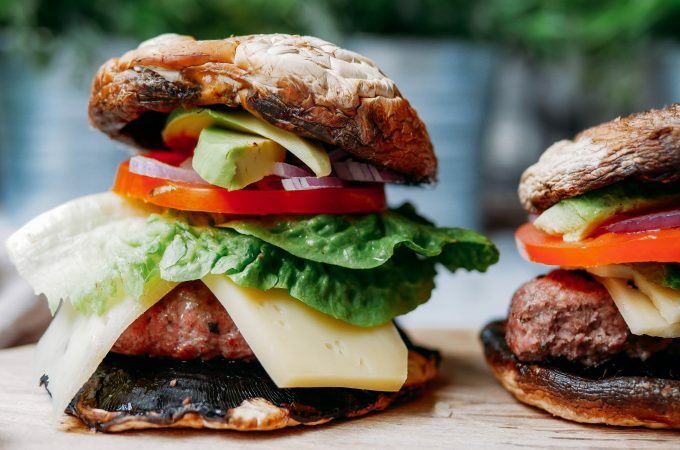 You don't have to stick to this recipe - get rid of the cheese if you are lactose intolerant/pale or ditch the meat pattie if you are vego. 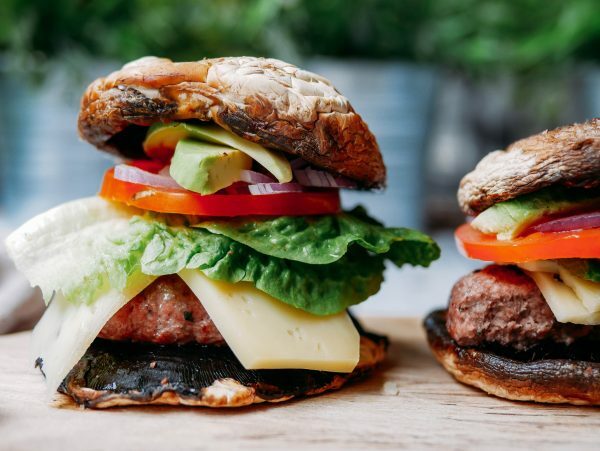 The recipe makes 3 burgers so double it up if you are making for the family.